Set outside the new capital of Tokyo during the Meiji Restoration and in Paris during the Franco-Prussian War, The Painting is a richly imagined story of four characters whose lives are delicately and powerfully entwined: Ayoshi, the painter, pines for her lover as she dutifully attends to her husband; Ayoshi's husband, Hayashi, a government official who's been disfigured in a deadly fire, has his own well of secret yearnings; Jorgen, wounded by the war and by life, buries himself in work at the Paris shop; and the shop owner's sister, Natalia, who shows Jorgen the true message of the painting. 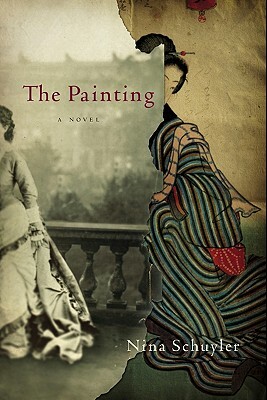 Exquisitely written and utterly spellbinding, The Painting reveals the enduring effect of art in ordinary life and marks the debut of a skilled stylist and first-rate storyteller. Nina Schuyler received her B.A. from Stanford University and an M.F.A. in creative writing from San Francisco State University. Her stories have appeared in literary journals, including Sojourn Literary Arts Journal and New Town. Her work has been nominated for Best New American Voices and the Wilner Award, and in 2001 she received the Bay Area Fiction Journal Award. Schuyler teaches writing at the Academy of Art College in San Francisco and lives in Fairfax, California, with her husband and son. This is her first novel.